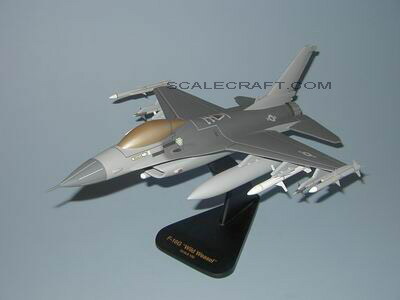 This specialized version of the F-16, which can also carry the ALQ-119 Electronic Jamming Pod for self protection, became the sole provider for Air Force SEAD missions when the F-4G Wild Weasel was retired from the Air Force inventory. The lethal SEAD mission now rests solely on the shoulders of the F-16 Harm Targeting System. Although F-18s and EA-6Bs are HARM capable, the F-16 provides the ability to use the HARM in its most effective mode. Mahogany Wood. Scale: 1/32. Wingspan 12 5/8 inches, Length 18 1/2 inches.